Designing a brand new cover has its challenges…but so does designing a book in a series. You have to make sure it follows the pattern, yet is unique and strong. And when you weren’t the one to design the first cover? It makes it interesting. One of the first books WhiteFire Publishing contracted was Shadowed in Silk by Christine Lindsay. Set in India during the end of the British Raj, just after WWI, this is a historical romance with a heavy dose of suspense and intrigue. At that point, I was not designing covers. We hired the amazing George of Tekeme Studios, and he blew us away with this fabulous cover for Shadowed in Silk. This third book jumps a generation. 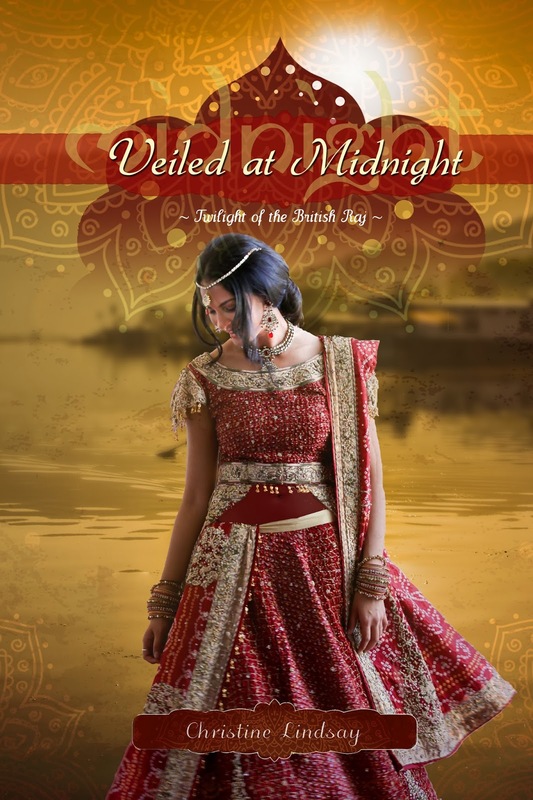 Set during the tumultuous partitioning of India and Pakistan in the 1940s, we were looking at a different setting and wanted to focus this time on the heroine from India rather than one of the British ladies. Our first thought was to use green and gold, to represent the Pakistan flag. The most compelling images we found were of a night sky, and my (very very very very very sloppy) playing around led to this. Not bad. The lighting in that sky is amazing. But the original image of the model had her in a red sari, and changing red to gold is T-O-U-G-H. I managed a fair imitation with the low-resolution comp I downloaded from Shutterstock, but I knew it would be much harder with the real photo. So I was pretty happy when Christine emailed and said that her critique partner convinced her that red might be okay. It was a color Dassah had shied away from in the earlier part of the book, because it reminded her too much of all the blood that had been spilt. But they decided that later in the book, she could instead realize it also represented the blood of salvation. So we began with this model picture from Shutterstock. We both loved the pose, and I especially loved the motion in the sari. Obviously, next we take out the background. Now, you’ll notice that in this traditional sari, the belly is showing. This is accurate, both today and historically, but we decided that for a CBA book, we probably shouldn’t have the bare flesh. So I inserted a semi-transparent layer to mimic sheer fabric there. Now it was time for the background. 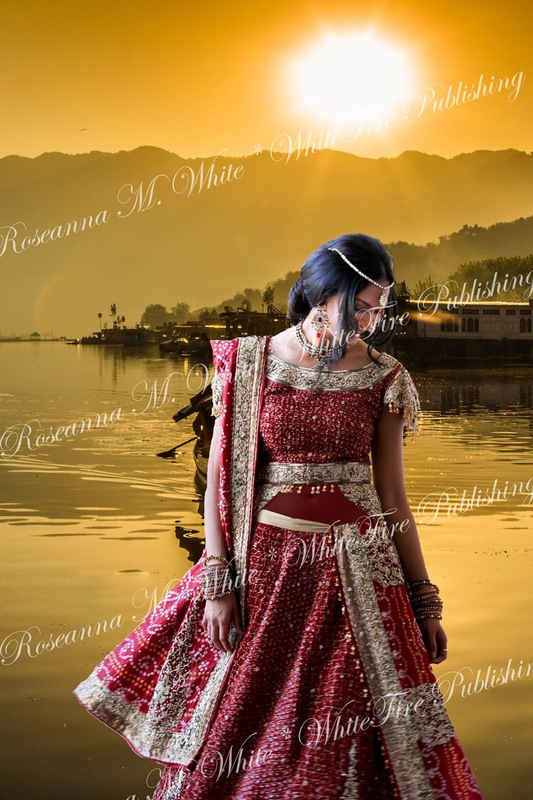 There are some absolutely GORGEOUS images of India that we considered. I knew the characters spend some time at a mountain lake, and I knew we wanted gold tones, so I decided to try out this one. Plopping Dassah in front of it, I got this. A good start. I liked the colors together, and the water. But I wasn’t wild about how distinct that building is in the back. And Christine pointed out (later, but let’s show the change now, LOL), that the light is hitting her on the wrong side. So I flipped her. To blur the background in the distance, but not the water up close–because I LOVE that reflection–I duplicated the layer, blurred the top one, and then applied a layer mask and faded the top image from the bottom of the screen upward–that way, the bottom layer comes through in its non-blurred glory toward the lower portion and fades into the blurred image at the top. Pretty, yes? But not there yet. The covers for this series are rich with texture layers. So to get the full effect and really see if it was going to give me the look I was going for, I first added in the elements that would stay the same as the first books (but with color changes)–the one I call “the lotus thingy” and the “banner thingy” that goes behind the title. Oo, I was starting to like how this was coming together! I went ahead and added the title. Which, for these books, includes the title itself, then the last word faded out behind it in an exotic looking font. Okay, so now I had a great base. I loved where it was going, I loved the way the red and the gold worked together. But now I needed to add some texture. In the first cover, Tekeme had used a flower overlay that I liked but couldn’t match exactly. So for book 2, I used a paisley design. For this one, I wanted something altogether different. So I did a search for “photoshop texture lotus gold” (don’t you love the random words you can put together for searches? LOL) and I found this one. It just felt promising from the get-go, LOL. So I plopped it down on the top, set the layer opacity way down, and used my fade-out gradient to make the middle of the layer completely transparent. Oh my. Yes. This was the point where my breath got all knotted up in my throat, and I knew I’d found my look. I went ahead and added the layer with Christine’s name, making it red. But that layer is also always textured, so I duplicated my texture layer, shrank it down, and this time didn’t fade it out. The result was this, and I gotta say, silly as it is, that’s it’s one of my favorite elements on this whole cover, LOL. So I added that, and also the series name where it belonged. And I was happy. Almost. Mostly. There was just one thing missing–a border. Each of the other two covers have a border, just a slightly-darker version of itself. I needed something like that here, but I didn’t want to mess with what I had already, so I nearly left it off. Then I looked at the original texture layer again. And I noticed that it had really cool sides that were not on my cover because I wanted the lotus part to extend off in both directions. How to get those on as the border, without interfering with the nice transparency of the original texture layer? Well, I fiddled with it until I figured out the obvious answer. I pasted it on, narrowed it to fit the width of the book, and then deleted everything accept that border part that I wanted. And voila! I don’t pick favorites, LOL. But I do adore this cover. I like the continuity with the other books in the series, but I also like where it’s different. I feel like this one was somehow more my design and less trying to mimic that first cover. And I just adore those colors together. So overall, we’re all very pleased. =) The Twilight of the British Raj will finish up in style!